Even before our official creation, we were teaching dance in other groups. Our goal is to now create a solid foundation for dance and to expand our school to include other dance styles. BALLET-CONTEMPORARY DANCE: In the past, we worked with an Ecuadorian ballet teacher. Now we are in contact with instructors who have graduated from the National Ballet School of Canada. We want our young students to have access to the fundamental principles of dance so that they may further advance and we can improve our technique in these fields. 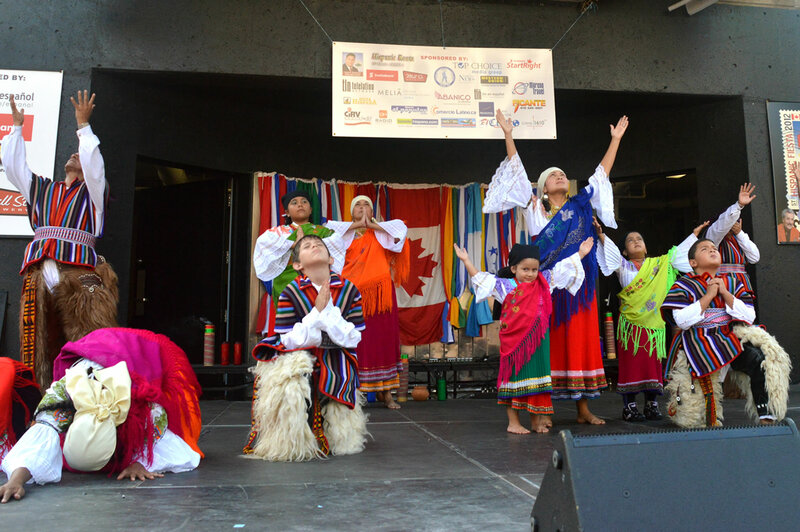 Traditional Folklore: Thanks to the support of El Salvadorian parents , Las Flores foundation and Hispanic Fiesta, we began in 2006 –a new Project—DanzArte—in order to include traditional dances from El Salvador in our repertoire. We have continued to further develop our Ecuadorian traditional folklore dance group -Nueva Siembra. Thanks to the support and efforts of our Director of Music, Mr. Marco Caza Diaz, ex-member of various renowned musical groups such as Imbayacunas, Hijos del Sol and Altitud, we are beginning to see the fruits of our harvest in the love that the children and adults have for our music. We now have a developing music group so that we can have live music and dance on stage. This year, 2009, has been our beginning, and at the festivals at which we have participated, the response from the public for this musical initiative has been exciting. We, as adults will one day leave the group, and we have a great desire to see more children and youth learn and preserve this wonderful music. We already have three children playing complicated Andean instruments called the zampoñas and the charango. Our hope is that the group will soon be entirely formed by children and youth. We have the guidance and the support of the now famous painter of Ecuadorian origin, Viviana Astudillo. Toronto Parks and Recreation has now made a room available for our activities in the Community Centre where we work, so that soon we will be beginning art workshops and classes led by Viviana. She is a source of pride for Latin Americans. Daughter of Ecuadorian parents, at her young age she has received many awards and honorary mentions and has worked with the Metropolitan Toronto Police and the City of Toronto. Many of her paintings have been made into cards for UNICEF. It is an honour and a great opportunity to have the opportunity to collaborate with Viviana, as director and founder of our school of painting. We will soon begin to create and develop future painters of Hispanic descent who reside in Toronto, Canada.